Catalina is using Smore newsletters to spread the word online. 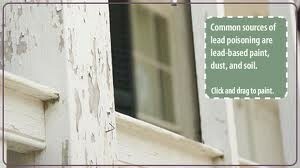 how can you prevent lead poisoning????????????? KEEP YOUR HOME AS CLEAN AND FREE FROM DUST AS POSSIBLE. The best way to clean up lead dust is to regularly wet mop your floors, wipe window ledges, and wash all surfaces with water and household detergent.TAKE OFF YOUR SHOES BEFORE ENTERING THE HOUSE. Make sure they are wiped well on a doormat outside the house. This will help prevent lead dust and soil from getting into the house.CHANGE OUT OF WORK CLOTHES and take a shower before coming home if you work with lead at your job. Lead dust brought home on the clothes of workers can spread in the house and poison children. Lead is used in many workplaces such as radiator repair shops, battery manufacturing plants and lead smelters.NEVER SAND, BURN OR SCRAPE PAINT unless you know that it does not contain lead.TEST PAINTED SURFACES FOR LEAD in any area that you plan to remodel, before you begin the work. If lead is in the paint, learn how to handle the paint safely. If the work is not done the right way, lead dust can scatter and poison your family, pets, neighbors and workers.ENCOURAGE HEALTHY EATING HABITS. Eating regular and healthy meals may make it harder for lead to hurt your child. Meals should include fruits and vegetables as well as calcium-rich foods (milk, cheese, yogurt, corn tortillas, tofu or bean curd) and iron-rich foods (meat, chicken, iron-fortified cereals, raisins, and dried fruit).Lead can also be harmful to pregnant women and their fetuses.It damages the brain and other parts of the nervous system. Some of the health problems caused by lead poisoning may never go away. 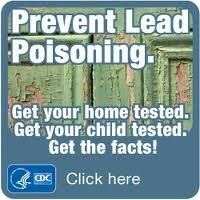 Lead in a child&apos;s body can slow down growth and development, damage hearing and speech, cause behavior problems and make it hard for children to pay attention and learn.Children also can get lead poisoning from living or staying in older homes that have lead paint. Many homes built before 1978 have lead paint on the inside and outside of the building.Consume tap water that is cold, rather than warm or hot. Use purified water or cold tap water when preparing infant formula and cooking. Older plumbing may contain lead, which is more likely to absorb into the water when it is warm. If warm tap water must be used in a home with old plumbing, run cold water from the faucet for 2 minutes before switching to warm water.Purchase products that are lead-free. Check labels on cookware, utensils and food storage supplies to make sure they are lead-free. Avoid purchasing these items second-hand unless the lead-free label is still intact. Avoid eating candy that is made in Mexico, as some have been reported to contain small amounts of lead. Regularly check toy recall lists and dispose of any toys that are shown to be contaminated with lead.